Great offer. Thanks. Program is easy to use, not as powerful as Photoshop, but certainly far more than enough for the average photo buff. Photo editing is used by photographers for many reasons. It can be used to correct errors that might show up in a picture, or can be used to apply final touches to the picture, or to put emphasis on a certain aspect of the picture to catch viewers attention. However, photo editing is not an easy task, it requires skill and knowledge to edit photos and also to use complex editing softwares. Most of these applications have been targeted at and limited to the professional audience, but now times have changed and availabilty of applications designed for consumers is increasing day by day. 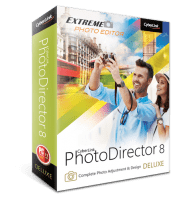 CyberLink PhotoDirector 8 is a photo editing software application, designed to help users perform professional editing to their photos with minimal effort and knowledge. Along with the ability to organize and tag your photos, you also have access to advanced photo editing tools, that produce professional results. As expected the installer size is large ~335MB, a stable and fast internet connection might be required to download it. The installation process is simple and straightforward, and does not take much time at all to complete. After completion of installation, it asks you to enter your license code to activate the application for use. Once done, you can start using this application to manage, as well as edit your photos professionally. The UI of the application looks simple, clear, well-organized and attractive, with a dark background that let’s your eyes focus on what’s important. At the top is the menu bar, with drop-down menus allowing access to different function and features. Under it are six tabs, that switch the interface among different functions. The available modes are Library, Adjustment, Edit, Layers, Slideshow, and Print. The panel on the left-side offers different options depending on the mode you are using. On the right is image preview window, with different options and buttons under it. At the bottom, it shows all the photos from the currently selected folder, so that you can access them easily. Moreover, there are buttons to rotate, zoom, change view, compare two photos, add face tags, mark photos, give them rating, and a lot more. Clean and Intuitive UI, easy-to-use for even users with little experience. Supports JPG, TIFF, RAW, PNG, PHI image formats export and import. Supports MP4, WMV video formats. Video-to-photo, blur tools, noise reduction, face tagging etc. Direct sharing to Facebook, Flickr, or Email. Easily and quickly create slideshows. Cannot filter photo collection by date and time. Importing is slower than other similar applications. CyberLink PhotoDirector 8 is a simple, yet powerful tool for photo organizing and editing. It does have a few disadvantages compared to other top of the softwares, but it’s price and the ease of use it provides justifies it all. It offers a smooth and clean interface, with powerful tools, ranging from basic to advanced. The application runs smoothly, without running into any errors or crashes. It is definitely worth trying. When you talk about photo editing, some of the top applications that will come to mind are Photoshop and Lightroom. However, given the rather professional and skillful approach that the two applications require, there is always room for other editing programs to find a share in the photo editing market. Rightfully so, there is CyberLink PhotoDirector 6 Deluxe that claimed to offer exactly that. I tried out the software to see how effective and easy it is to use it. In terms of size, CyberLink PhotoDirector 6 Deluxe is a bit of tone down when compared to Photoshop. However, downloading the 246 MB program and installing it will take you anywhere between 10-20 minutes. The interface is well laid out hence does not present a clustered arrangement. The main editing options run at the top bar of the program as their respective sub-options show on the left side of the interface. A quick overview of the main options like the Library, Adjustment, Edit, Slideshow and Print revealed a whole bunch of other sub-options. Apart from being easy to understand what each of the options would do, they only require single clicks or simple sliding to the right or left. While using CyberLink PhotoDirector 6 Deluxe to edit photos, I found its four view modes to be really helpful. The View Modes are: Viewer & Browser Mode, Viewer only, Browser only and Fullscreen. Of the four, I mainly toggled between Full screen and Viewer & Browser Mode to check out my modifications. Although the other editing options in CyberLink PhotoDirector 6 Deluxe still have a good number of sub-options, it was the Edit option that was the winner for me. Just but to mention a few, the sub-options further fall under People Beautifier, Photo Effects, Object Removal, Extract or Compose, Photo Merge and Watermarks. However, it was the Face Swap option under Photo Merge that impressed me the most. I was able to merge two photos to get the best smiles on the subject’s faces. I was using CyberLink PhotoDirector 6 Deluxe alongside Photoshop and Illustrator and I found it to be a little bit laggy. At the same time, its memory usage was among the top. As such, if you have a personal computer with limited RAM, expect the program to slow you down. It was thoughtful of CyberLink PhotoDirector 6 Deluxe’s developer to include the Share button. However, the option did not work for me. Every time I tried choosing between Facebook and Flickr, I got the Check your internet connection error. 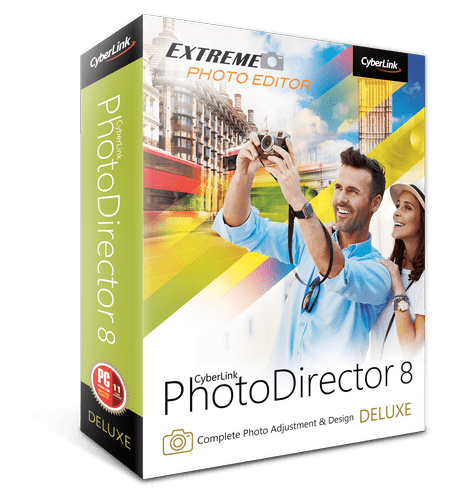 CyberLink PhotoDirector 6 Deluxe offers an alternative to the already industry leaders in photo editing. Its collection of one-click editing options may be the main for you to choose it. As such, you will not be disappointed if you choose to download it. CyberLink PhotoDirector is a high quality image editor which can be used by a complete amateur with ease. I installed it mainly because I need its intelligent object removal feature. I tested that out on half a dozen images today, and the results were excellent. The unwanted objects were removed cleanly without detectable traces, and with never more than two passes needed. The cleverly designed area selection tool is easy to control, allowing the whole process to be fairly quick and painless. (Of course context-aware removal is just one of the many features available, but I don’t have time to test the others today.) The clean and clear UI, the 140-page user guide and the instructional videos on YouTube also made a strongly positive impression on me. Many thanks to CyberLink and SharewareOnSale for this great giveaway. In a field that has been dominated by Adobe Lightroom, Cyberlink PhotoDirector offers direct competition with the inclusion of impressive digital photography editing tools and an intuitive user interface. For those familiar with Adobe Lightroom, it is easier to tell that Cyberlink PhotoDirector is indeed aping what the former offers and only adding a few tweaks to bring a feel of uniqueness. Nevertheless, it is still an inexpensive alternative that’ll come in quite handy. For a software that’s already heavy, you don’t want to add a clustered user interface with graphics that will increase its size or make it slower. The manufacturers behind this product made sure to consider this option by creating a simple but very effective interface. The editing and settings options are clearly laid out and can be used with ease. Cyberlink offers more than just minor adjustments on the photos. There is an edit and adjustment tab, both offering the same thing but at different levels. In the adjustment option, you can combine images, edit faces with the beautification tools, create panoramas, and edit and remove objects in the background, among many other things. The editing options acts adds a small variety of effects, adds watermarks, and merges HDR exposures. Cyberlink PhotoDirector allows for stacking of photos of the same subject together and you can create a timestamp for each. You can also create a stack manually by clicking on the bottom section of photos and then choose a manual stack. Both manual and automatic stacks will appear in the library in the same way. This software provides a really useful option to correct issues that have been introduced by the lens that was used to shoot the photo. Although this option is useful, the lens database isn’t that populated and you may not find your camera lens. You are also required to use original camera files for this to work properly. I find Cyberlink PhotoDirector slow in loading photos to the editor. Although speeds vary with the size of the photo, it is generally slower than lightroom. Plugins serve to increase the functionality of software and PhotoDirector could have benefited a lot from their inclusion. Although Cyberlink PhotoDirector allows for a wide range of editing options, it is not as powerful as a photo editor should be. There are many actions that can be done better with a regular editor. Although the PhotoDirector offers improved editing tools than its previous version, they don’t perform as expected. It is not the best digital photography tool but an inexpensive option to Adobe Lightroom. It is worth downloading. With my experience, this review is exact !! !